On August 12, 1845, on the occasion of the first Beethoven Festival on the 75th birthday of the composer, the famous monument on Bonn Cathedral Square was unveiled as part of a multi-day festival, where Franz Liszt was directing. 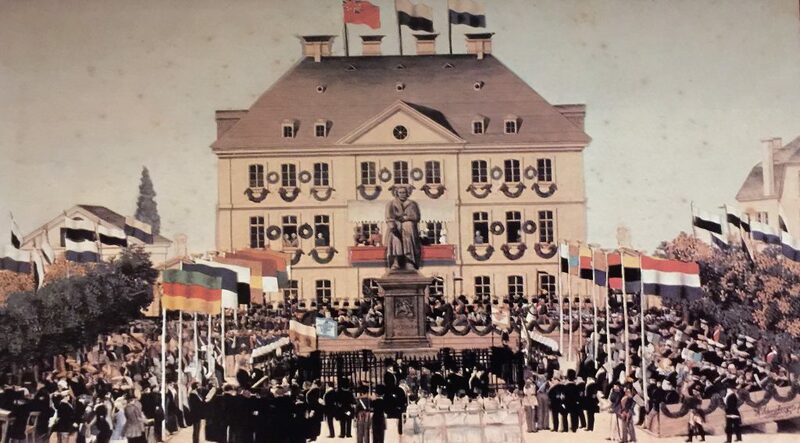 On the occasion of the 175th anniversary of the inauguration of the Beethoven monument and on the occasion of Beethoven’s 250th birthday as a citizen of Bonn, today’s citizens of Bonn will reconstruct the scene of that time in a historic ambience. The performance day for the “Ceremony” is Sunday, August 16, 2020. The musical framework of the performance is provided by Bonn choirs and orchestras as well as numerous corps with a total of several hundred performers in historical costumes. Not only will the citizens and their representatives attend, but also – exactly as in 1845 – her Majesty Queen Victoria accompanied by the Prince Consort, then Prince William IV of Prussia, his wife Princess Augusta, the Prince and Princess of Prussia, Alexander von Humboldt, Franz Liszt, choirmaster Dr Breidenstein and Hector Berlioz will be present as guests of honour – on the historical balcony of course. © 2019 175 Jahre Beethovendenkmal in Bonn.